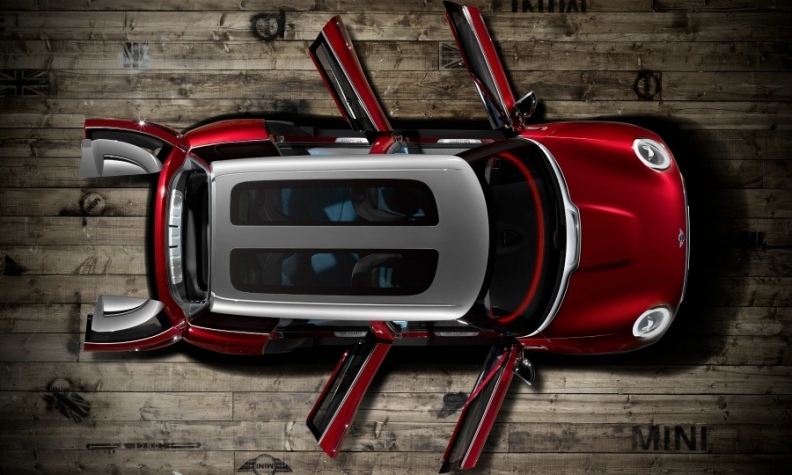 The new Mini Clubman will go on sale this year with the same 6-door layout as this concept shown in 2014. To boost Mini’s prospects of long-term profitability parent BMW Group has decided the British brand needs to shrink its lineup to five models from eight. Mini is expected to discontinue three slow-selling vehicles -- the Coupe, Roadster and Paceman – so it can concentrate on the five model lines that accounted for about 95 percent of the 325,000 vehicles it built last year, according to data from IHS Automotive. BMW Group does not report individual financial results for the BMW, Mini and Rolls-Royce brands, which has left analysts wondering whether Mini has ever made any money. Mini’s industrial matrix is complex. It builds eight models underpinned by three different platforms in three different plants and has had an average annual volume of about 313,000 units in the last three years. Warburton expects Mini to become more financially viable once it starts offering a smaller, more consistent range underpinned by a single architecture, which will be shared by BMW brand models such as the 2-series Active Tourer and the next-generation 1 series. Peter Schwarzenbauer, the BMW board member in charge of Mini, has been a strong advocate for a radical review of the Mini range. “It is important to find the right balance between growth and profitability,” he said late last year while announcing that Mini’s range would be trimmed. Schwarzenbauer said Mini would focus on “superhero” vehicles including the three- and five-door versions of its core hatchback, the Countryman and the Clubman station wagon, which will be renewed this year. “Like a superhero, each of these cars has its own personality and unique capabilities,” Schwarzenbauer said, without identifying which Minis would be cut and when. However, Oliver Friedmann, the Mini’s head of product management, told Automotive News Europe last year that the Coupe, Roadster and Paceman are not “a priority” in the automaker’s renewal plan. The Coupe and Roadster were conceived as small-volume variants that would help maintain interest in the brand as it transitioned to the fourth generation of its top-seller, the Mini three-door hatch, which debuted last year. IHS Automotive expects Mini to discontinue the Coupe and Roadster this year. Mini also is counting on profits to rise following a radical industrial reorganization of its main factory in Oxford, England, that has boosted daily output to 1,000 vehicles a day from about 700. A key part of that was the switch to making cars using BMW Group’s UKL platform at the plant. The first Mini cars to be underpinned by the UKL architecture are the new three- and five-door hatchbacks. The second-generation Clubman also will use the platform when production starts in Oxford later this year. Oxford builds the Convertible, Coupe and Roadster on the platform BMW created to relaunch Mini in 2001. Magna Steyr’s plant in Graz, Austria, builds the Countryman and Paceman using a dedicated platform. BMW confirmed it will build another model in Graz after it shifts the next-generation Countryman to another plant. 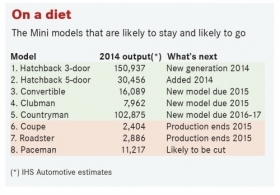 IHS expects production of the new Countryman to start in 2016 at the VDL NedCar plant in Born, Netherlands. VDL began making the Mini three-door hatchback in July 2014 using the UKL platform.